Although all the dental treatments and procedures are done with the help of hygienic tools and appliances under the guidance of professional and certified dentists, yet sometimes it fails to prevent infection or there are some misshapen resulting into loosen gums, roots or even tooth decaying. Some dental treatments require intensive care before; during and after the process and tooth scaling is among them. Even a single negligence can lead to a destructive action to your tooth or whole teeth set, leading to severe gum or root infection or tooth decaying. Therefore, one must be quite aware of the recommendations and precautions before, during and after the tooth scaling process. However, there are some side effects listed here related to the tooth scaling that you must know. What is Scaling or root planing? In order to clean the tooth or gum-line area or gum-pockets to avoid germs and hence infection, the process known as “tooth scaling” and “root planing” is used. In this procedure, the plaque which is filled with time span into the gum pockets or over tooth or gum line area is scraped away, letting the gum line regain its smoothness and help you get back your healthy and uninfected smile. 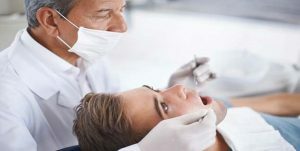 Although the process of root planing and tooth scaling is or the good of your oral and dental health yet there are some complications while going through the scaling procedure. These complications as well as side effects have been listed below. 1- If the process of tooth scaling has been done inadequately, then it may lead to loosen gums which will ultimately result in tooth decaying. 2- If you are diabetic or having heart problems then you must make sure if you should go through the process of tooth scaling or not; as it may raise some critical issues. 3- Inadequate scaling may also lead to gum problems or raise periodontal diseases. This case occurs when there is some plaque left over in the gum-line while scraping it away which is sufficient for bacteria to again home in. 4- Sometimes it has been seen that after the scaling process, the gum line is swelled or gets tender. 5- You may also have tooth sensitivity for cold or hot meals. 6- Inappropriate scaling also results in exposed roots which start bleeding whenever you eat or drink something hot or cold. 7- If you smoke or love stuffs like pop-corn or chips that are hard to bite and chew, then you must take care not to consume these things after the scaling process as it may lead to the failure of scaling process, scratching your gums, and the substance will again get filled in the gum pockets which will invite the bacteria again. When the gum pockets are filled with more than 3 millimetres of plaque, it invites a large number of bacteria to home in the gum pockets which will definitely lead to infect the pulp, gum-line area and hence your teeth in the most critical manner. It will lead to a condition where scaling or root planing is not sufficient to heal the damages. So we must always make sure that we should take care of teeth and gums in the most effective manner. To avoid your teeth and gums from getting infected by bacteria, you must make sure that there should be no filling of substances in your gum pockets that invite bacteria or consume much alcohol or cigarette as they lead to make space for bacteria. Besides this, you should take care of your teeth, brush and floss on a regular basis, visit to your doctor for regular checkups and seek expert’s consultation before teeth scaling.